San Francisco Renegades - 7:00 p.m.
Santa Clara Vanguard Cadets - 7:34 p.m.
Blue Devils B - 7:51 p.m.
Blue Devils C - 8:08 p.m.
Pacific Crest - 9:00 p.m.
Blue Knights - 9:34 p.m.
Santa Clara Vanguard - 10:08 p.m.
Blue Devils - 10:25 p.m.
You have two different ways to view this webcast:The $14.95 pay-per-view option will grant one-time access to watch all of the performing corps at Stanford. Choose the Fan Network Plus, Premium SD or Premium HD subscription options for complete access to all 2010 webcasts, on-demand replays of select DCI Tour events, discounts on downloadable media, and more! 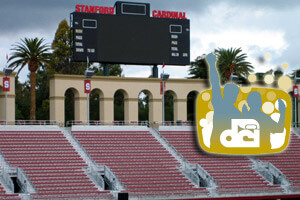 Visit TheFanNetwork.org to register for the DCI West webcast.